I love hit points. They’re a brilliant abstraction, though often misunderstood, and they work beautifully in play. I double-super-love that in OD&D, how you roll them for your character is completely open to interpretation. I don’t think that’s been true since the late 1970s, as each edition since has spelled things out much more clearly. This isn’t news, and I’m not a scholar uncovering D&D’s Hidden TruthsTM. These two threads on the Original D&D Discussion boards are both great reads on this topic: In defense of the original HD system and Origins of hit point re-roll at every new level?. I’m just a dude exploring old-school D&D and having fun poking things with a stick, and one of my maxims is that everything is new to someone. It’s fun to talk about this stuff, and here on Yore is where I like to talk about it. Dice for Accumulative Hits (Hit Dice): This indicates the number of dice which are rolled in order to determine how many hit points a character can take. Pluses are merely the number of pips to add to the total of all dice rolled not to each die. Thus a Superhero gets 8 dice + 2; they are rolled and score 1, 2, 2, 3, 3, 4, 5, 6/totals 26 + 2 = 28, 28 being the number of points of damage the character could sustain before death. That first sentence seems clear enough: you roll hit dice to find your hit points. And the second sentence just explains what “3 + 1” means: add the “+ 1” just once, at the end. So far, so good. Then we get to the example. “Superhero” is the title for an 8th-level fighting man, listed as “Super Hero” in the chart. At 8th level, our doughty fighting man gets 8 + 2 Dice for Accumulative Hits — and in the example, they’re all rolled at once. I don’t think I’d have noticed this on my own. If I hadn’t stumbled across folks talking about hit dice online, and then read those two threads above, I’d almost certainly have assumed you rolled HP the same way in OD&D as in every other edition — and maybe you do! Which is the neat part. Consider this: Which of these is correct? The fighting man adds 1d6+2 to his existing hit point total (which has been going up by 1d6, sometimes with a small bonus, every level). The fighting man rolls 8d6+2, and now has that many hit points. It doesn’t matter how many he had before — this is a fresh roll. I don’t see anything in OD&D that clarifies this, which suits the game’s DIY spirit just fine in my book. But if that second option, rerolling HP every level, sounds weird, consider Empire of the Petal Throne. M.A.R. 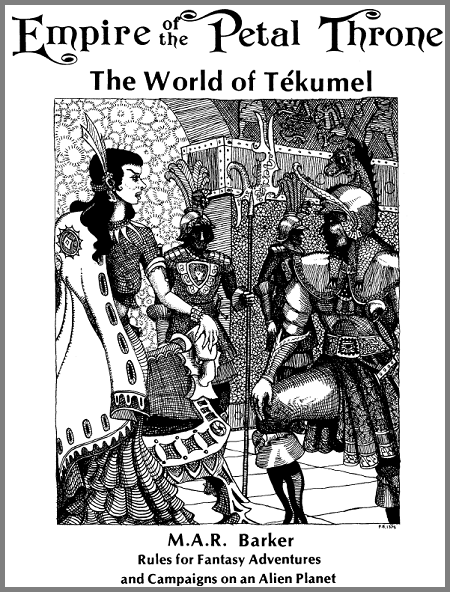 Barker’s Empire of the Petal Throne came out in 1975, just one year after OD&D, and it does a lot of things exactly the same way as OD&D — but not everything. That makes it an interesting counterpoint to D&D in some respects, notably this one. As each player enters the game, he or she shakes on 6-sided die to determine his or her available hit dice points. As each succeeding level of experience is reached, the indicated number of 6-sided dice are shaken to determine his new total. No character may ever have LESS hit points at a higher level than he did at a lower one. This, if a warrior shook two 5’s and had 10 hit points at level II, and then on reaching level III shook three dice but got only a total of 7, he adds 3 points to maintain his total at his previous 10. He must always equal his previous total, although he may not be lucky enough to surpass it. Much clearer than OD&D: You roll hit points anew each level, keeping the new total if it’s higher. Which is pretty wild! I’ve never played D&D that way, and it sounds like it’d be fun to try. But what did Gary and Dave actually do? Gary used to give us the option of rolling an additional die, or rerolling all your hit dice. However, if you rerolled them all, you took the new number, period. You could also reroll at the beginning of an adventure, rerolling them all. Not sure how Dave did it. So at Gary’s table (at least during that time), you not only got to choose which option to use — from the two we’ve already looked at, additive rolling or full reroll — you could also reroll at the start of an adventure. And either way, there’s none of EPT’s “keep the highest.” Nifty. Everyone I know of kept hit points as rolled. Gary also notes that the omission of a spot to record HP on the OD&D character sheet was an oversight, so it seems likely that he was doing this — roll and keep — in that same general time period. My gut sense is that rerolling HP every level would make all PCs’ HP trend towards the mean — average out, basically. No one gets hosed by one or two bad rolls (at least not for long), and no one enjoys wild advantages based on very lucky rolls (ditto). But I can’t back that up with math. This does not have a central distribution: it reduces the probability of getting small numbers rapidly, and drives the weight of the probability distribution towards the maximum. Fascinating! My gut is apparently totally off. I love the fuzziness of OD&D in areas like this. It’s a feature, not a bug, and it encourages individual groups to develop their own approaches to the game. 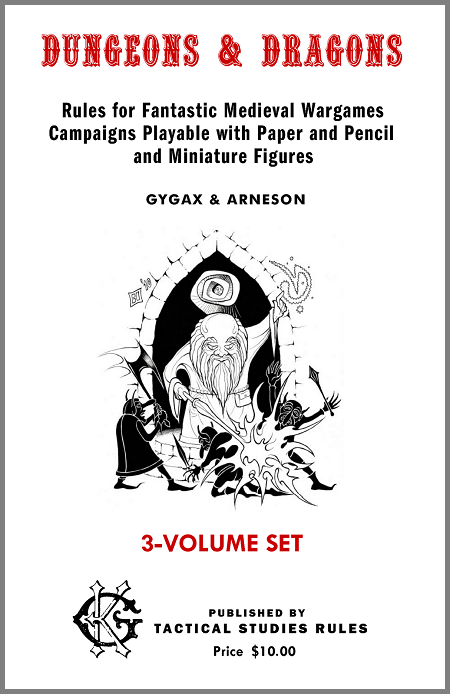 Just as Gary and Dave almost certainly weren’t playing the same game even as they were publishing it, playing OD&D looks like it requires a willingness to make up all sorts of things on the fly — including how you handle something as central as characters’ hit point totals. And just like every time I’ve delved into OD&D, this makes me want to run it more than ever. This is just one of so many things Jon Peterson‘s stellar Playing at the World has been illuminating for me. I suspect I’ll be blogging about PatW at some point — it’s so good! Some of that math analysis I’m not really behind. In particular where he says “The chance of a 6 on a d6 is 1/6; if you give a 9th level cleric 8 rerolls of their first level hit dice, they are going to have a very very low chance of getting anything but a 6. ” is very true but it’s not at all what this system is doing. That would be if you recorded each hit die separately and each level re-rolled each one keeping the higher of each. Ie: at level 2 I had a 6 and a 2. Level 3 I roll a 3, 5, 4 and keep 6,5,4. You can also see from his empirical charts that the magnitude of effect he’s discussing is actually fairly small whereas his verbiage makes it sound much more dramatic, though it would have been nice to seen means since the skew (lopsidedness) of the re-roll keep high system means it’s average isn’t just the value with the highest probability. P.S. these topics that you’re discussing consistently make me stop and read your post and consider commenting. Very interesting stuff. Keep it up. P.P.S.S I may make my own analysis of these numbers over at the stew. That was my first thought on reading and then when you said it had been done I was kind of disappointed but on reading the article you linked I think I can still add something with additional analysis. I would love to see you run those numbers. I was working on another math-y post last night and whining to Alysia about how inept I am at math beyond the basic stuff. Banging my head against has been a good learning experience, though. I’ve been using OD&D’s HD scheme along with EPT’s reroll rules for several years now. It allows me to mechanically do things that can’t be done with Greyhawks/AD&D’s add-and-roll system. Firstly, I can provide bonus hit points at low levels without leading to hit point inflation at high levels. For example, characters start with a number of hit points equal to their Constitution but only gain hit points when their rolled value exceeds their current total. More survivability at low levels but no effect on upper level hit point totals. Second, it makes OD&D multiclassing easier. you reroll hit points for each class when that class levels. There’s no need to average out hit point rolls which means there’s no need to restrict multiclassing to even XP split. Third, it let’s me change the type of die during the life of a character. For example, I let player’s play giants which start out with normal hit dice. However, after a certain time (not level) those dice increase in size as the giant grows. So a giant might be rolling 3d6 one level and 4d8 the next. I use the OD&D hit dice value as an attack value. So any character with 4 hit dice fights as a fourth level character, regardless of class. It removes an entire table from the game. Also, it let’s me decrease hit dice, something you can’t do with the AD&D system. Magic users max out at 11 hit dice and slowly lose hit dice as they become more dependent on magic over physical combat. Finally, I replaced level drain with permanent hit point loss. A character’s hit point total is reduced but, since the character re-rolls at each level, they have a chance to regain them at the next advancement. Eventually, they’ll fully recover. This method replicates the “weakness” of these undead’s attacks without requiring me to re-calculate levels. Those are interesting house rules. I like how you’ve centralized things around hit dice — that’s a clever approach. How does the math for “attack value based on HD” compare to the math for OD&D as written? I’m glad someone else has thought of and tried Constitution as starting hit points. It’s something I’ve been thinking about doing myself. I love your blog style and content. Keep up the good work. Thanks! I just popped over to your blog, and wow do you have some excellent obscure RPG write-ups there! Very cool. Hello Martin, thanks for linking to my blog post on the effect of rerolling hit points. In response to questions above about how serious this effect is, I think it gets smaller at higher levels because of the nature of the distribution of many dice. It’s biggest in the step from level 1 to level 2. Matt N is correct that the system is not requiring you to record your dice rolls and only replace the better ones, but effectively that’s what it does. Consider the step from level 1 to level 2. Suppose at level 1 I rolled 1d6 and got 1; at level 2 I roll 2d6 (because I’m rerolling lvl 1) and get 2 and 4. Obviously I have now replaced the 1 with a 2. I should have a 1 in 36 chance of 2hp at level 2, but with this new system I only have 1/218 – I have to roll a 1 at level 1 and 2 ones at level 2. By the time I’m at level 8 though (for example), the central limit theorem means that any time I roll the pool of dice I’m likely to get a number near the last pool I rolled. I don’t think it matters, but there’s a huge power step in going from lvl 1 to lvl 2 because your hp are likely to exceed the damage done by a single sword blow. This method significantly increases the size of that power step, since you get to increase your level 1 roll if it was low. Thanks for stopping in to explain! I don’t follow 100% of the math, but I do get what you mean about the shrinking impact of the system. My pleasure! In my opinion the roll-again rule is way less of a problem than the general problem in all flavours of early D&D that your power does this huge vault at level 2. This happens because a sword does the same damage roll as your lvl 1 HD, (e.g. d6 dmg for a sword, d6 HP), so on average when you reach lvl 2 you have doubled your survival chances. Then when you go to level 3 you’re adding one more weapon strike to your HP, so you’re increasing your survival chances by 1/3, etc. This is different to more modern games where you start with some largish number of HP and then add small amounts as you gain levels (or cf GURPS where your HP basically never go up). I like the idea of increasing HP, but I think the step should be smaller. Compared to that step and its huge arbitrariness (e.g. I rolled 1HP at level 1 then 7 at level 2!) the rerolling thing is just an oddity, nothing more.